Mark Crakanthorp tightens the bolts on a flail mower. Slashers, finishing mowers and flail mowers all have their particular field (pardon the pun) where they excel. However, one of the biggest factors influencing the performance of these machines under any given circumstances is their mechanical condition. For the purposes of maintenance, this can best be broken down to four main areas: – PTO shaft, clutch/gearbox, shafts/belts and blades, bolts and washers. When you purchase a machine, it is necessary to familiarise yourself with the operator’s manual regarding its proper use. Most premature wear or machinery failure can be attributed to incorrect operation. If it is a new machine, the dealer should have performed a pre-delivery check. I would still advise you give it the once over with a spanner before using it, though. Needless to say, a demo or secondhand unit needs to be thoroughly inspected. 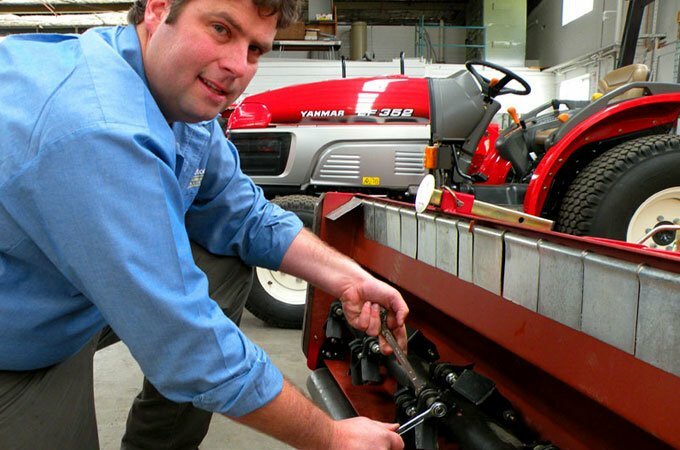 The following are some tips for maintaining your machine. As the mode of power transmission from tractor to implement, it is vital that the shaft is in good serviceable condition. It is important that the shaft is correct for the implement, as per the manufacturer’s instructions, and is the correct length. Most PTO shafts are telescopic, allowing them to adjust sympathetically to the implement’s level. If it is not the correct length, some fairly catastrophic events may ensue. It’s very important to check the upper limit of the TPL hydraulics as well. 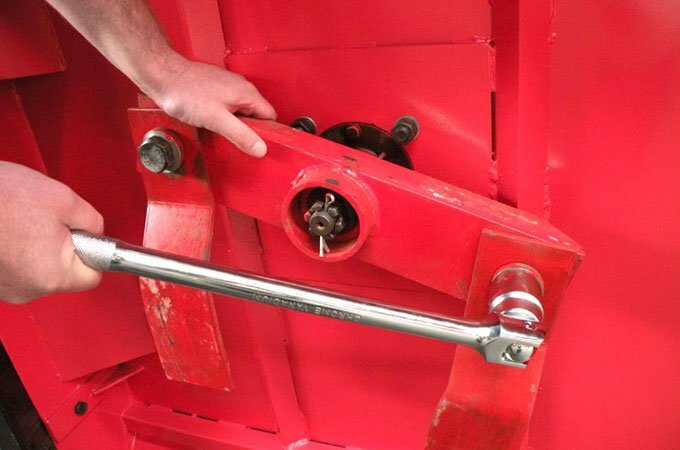 This ensures the PTO shaft is not crushed when the implement is lifted. 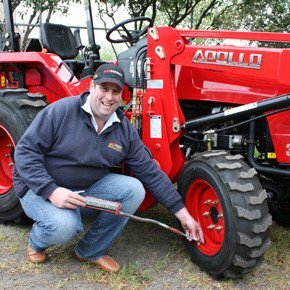 Regularly use a grease gun on the PTO shaft for reducing friction (wear). Grease is your ally when maintaining the PTO shaft. Grease the shaft every 20hrs or monthly, depending on usage. 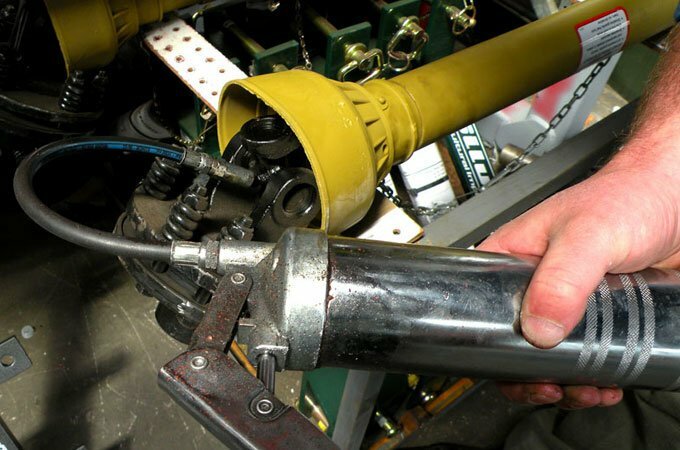 For the universal joints, hit them with the grease guns fairly regularly, again, depending on use, say every 8hrs. When carrying out maintenance, check the uni joints for slop or excess play. If they display these symptoms, they are on their way out. Get them replaced or repaired. Another place to keep well lubricated is the PTO output on the tractor and gearbox stub shaft on the implement. Regular applications of grease will reduce friction, and hence wear, on the splines and shaft as well as keep the spring loaded locking pins in good condition. Most manuals recommend every 20hrs. Also, keep an eye on the condition of the PTO shaft guards and replace them if they fall into disrepair. Tightening nuts on a PTO shaft slip clutch. Clutches are installed on the PTO driveline to allow the rotating blades to slip when they encounter heavy load bearings or upon colliding with a solid object. Mostly, these are set by the factory/ dealer when purchased, but some adjustment may be necessary under some conditions. To adjust, remove the PTO and turn each of the adjusting nuts on the clutch springs one half turn. If the clutch is slipping under light loads, tighten (clockwise), or increase pressure on the springs. Reinstall and test for slippage. If it continues to slip, repeat the step. It is important to do these adjustments evenly and in small increments. Over tightening is not desirable, as it may result in gearbox or PTO shaft failure. 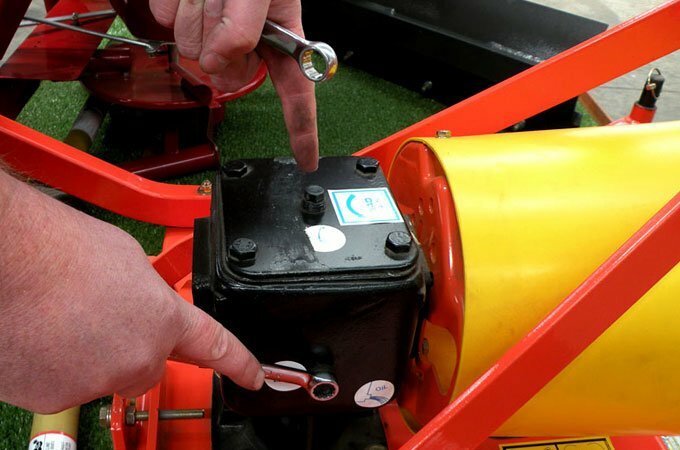 Testing the oil level on a finishing mower – if no oil flows out of the side, it needs a top up. As gearboxes are sealed units, the oil shouldn’t need changing. The best thing is to check levels as per the operator’s manual recommendations. Commonly, there are two bungs – one for filling, and one to indicate the optimum oil level. If you remove the level bung and no oil flows out, it could do with a top up. Add the recommended gearbox oil until it begins overflowing and quickly replace the bungs. It is now ready to fight another day. Please beware that the gearbox can get rather hot after prolonged use. 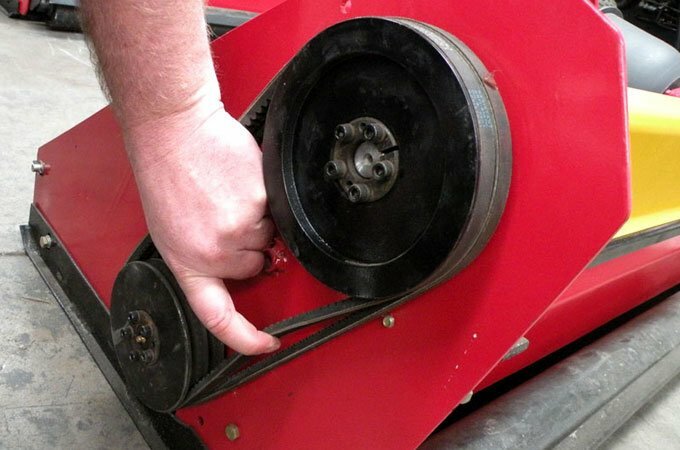 For finishing mowers and flail mowers, power from the gearbox is transmitted to the blades via V-belts and pulleys. These will need checking as part of your maintenance routine. Assess the condition of the belts and replace as necessary. The desirable level of tension is attained when about an inch of movement can be achieved by pushing and pulling on the belt at its mid point between the pulleys. Refer to your manual to correctly operate the tensioning mechanism. 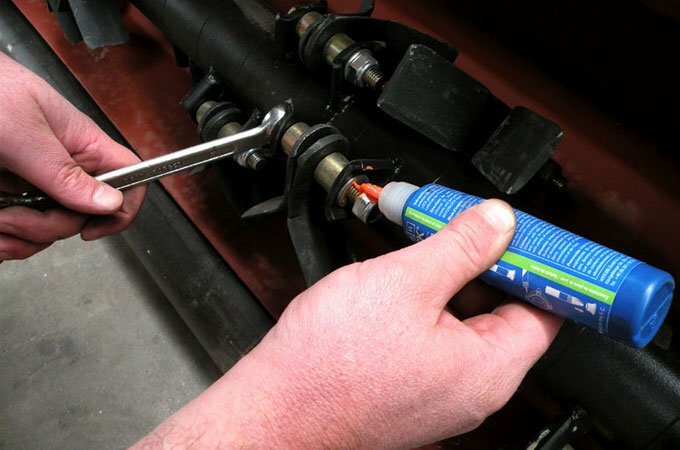 By blowing out any trapped material with compressed air, and regularly greasing the pulleys where applicable, you can extend the life of your belts. If you do not have access to compressed air, hose the clippings out. A top idea is to run the machine stationary after hosing it out. This allows the fanning effect of the blades and heat of the moving parts to dry it out. This will prevent corrosion. Check for tension by pulling the belt at it’s midpoint between the pulleys. The tension on this flail mower belt is too loose. As you are commonly beneath the machine to work on the blades, never trust the hydraulics of the tractor to keep it raised. Chock it solidly on even ground prior to inspecting it. 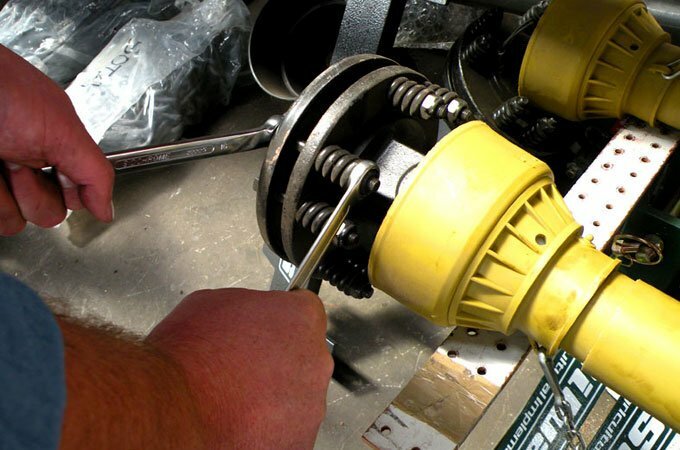 The blades, (and the nuts, bolts and washers that keep them there) are subject to the most wear and tear and should be inspected every time you wish to operate the implement. To increase their efficiency, the blades are purposely designed to flail on the rotor. When the machine is operated below its optimum RPM, the lower centrifugal force has the effect of causing continual friction and pressure on the blade, bolt and/or washer, hence prematurely wearing them. Tussocks and tough grasses can dull blades very quickly. With finishing mowers and slashers, you can resharpen the blades if everything else looks serviceable. I think for flail mowers however, given that they have 30 – 40 blades, you are better off replacing the blades than painstakingly resharpening them. If experience has taught me one thing, it is to invest in some lock-tite when replacing bolts. Wear, accumulated material and corrosion can make removing worn components nightmarish. You will thank yourself when it comes to servicing the blades next time around. Lock-Tite seals bolts in place when tightening them. Make sure you use good quality ring spanners and/or a decent breaker bar and socket to get a good purchase on the bolts. Grazed knuckles and stripped threads are a precursor to percussive maintenance. Not listed in manuals, percussive maintenance is one of the less productive arms of mechanics. Fine particles of pulverised plant and soil material will aggregate underneath and around the cutting area. When it dries it can set like concrete. Apart from causing corrosion, excessive build up around the bolts and blade can prevent the flailing action of the blade, increasing wear by concentrating friction to a limited area. The best shot is to blast it with a high pressure hose. Take care to store it away when dry in the aforementioned manner. When replacing bolts and blades, ensure you check for any vibrations that might indicate loose bolts or imbalance by slowly bringing it up to operating RPM. You may have to retighten bolts and ensure the installation procedure was followed correctly. Blades, bolts and washers should be replaced in sets to keep the rotors in balance. Retighten all bolts when replacing bolts and blades.